Photo: The hard copy edition of the Fall 2007 EFN is prepared a few weeks ago by Bonnie Beach and volunteers (Evelyn Jones, Judi LaGrange, Dalton States, Hannah Riddle, Lydia Riddle, and Samuel Riddle). The last (fourth) issue of the EFN for 2007 was put in the mail about two weeks ago. I got a phone call this morning from at least one Pastor friend across the mountain who enjoyed reading his copy. Brian Davis has also posted a copy to read here. From the sermon “A Christmas Question” from Isaiah 9:6 preached by Charles H. Spurgeon at Exeter Hall on Sunday, December 25, 1859. Now there is a proclamation gone forth today and it is a true one, too, that Jesus Christ has come into the world to save sinners. The question with you is whether He has saved you and whether you have an interest in Him. I beseech you, give no sleep to your eyes and no slumber to your eyelids, till you have read your “title clear to mansions in the skies.” What, man? Shall your eternal destiny be a matter of uncertainty to you? What! Is Heaven or Hell involved in this matter and will you rest until you know which of these shall be your everlasting portion? Are you content while it is a question whether God loves you, or whether He is angry with you? Can you be easy while you remain in doubt as to whether you are condemned in sin, or justified by faith, which is in Christ Jesus? Get up, Man. I beseech you by the living God and by yours own soul’s safety, get up and read the records. Search and look and try and test yourself to see whether it is so or not. For if it is so, why should not we know it? If the Son is given to me, why should not I be sure of it? If the Child is born to me, why should I not know it for a certainty, that I may even now live in the enjoyment of my privilege—a privilege, the value of which I shall never know to the full, till I arrive in Glory? Again—if it is so, another question. Why are we sad? I am looking upon faces just now that appear the very reverse of gloomy, but maybe the smile covers an aching heart. Brothers and Sisters, why are we sad this morning, if unto us a Child is born, if unto us a Son is given? Hark, hark to the cry! It is “Harvest home! Harvest home!” See the maidens as they dance and the young men as they make merry! And why is this mirth? Because they are storing the precious fruits of the earth, they are gathering together unto their barns wheat which will soon be consumed. And what, Brothers and Sisters, have we the bread which endures to eternal life and are we unhappy? Evangel article December 20, 2007. Sever any tie but the tie that binds me to Thyself. 1. Jesus taught a radical form of discipleship that places loyalty to him above loyalty to everything else, including our families (see Matthew 10:32-39; Luke 14:25-27; Mark 10:29-30). 2. The family is a God-given institution that is highly valued by God as an instrument for establishing and building his kingdom, but it is not ultimate. Only Jesus is ultimate. Simply put the family is only the means to an end. It is not the end in and of itself. The end is knowing and serving Christ. The family might be an instrument to get us there. But if we have a lovely family life, yet still do not know a passion for Christ then we have still failed miserably. 3. Our union with the human family is only temporary. Our union with Jesus is permanent (see Matthew 22:30). 4. Although our relationship with Jesus is ultimate, but this does not mean that our relationship with our family is unimportant or that we might not share with those who are our natural relations also a rich spiritual relationship centered upon a common commitment to Christ. Some run the risk of neglecting or sabotaging their relationships with their families in some high-minded but wrong-headed attempt to put Christ first. It does not have to be either my family or Christ, but a real blessing occurs when it is my family alongside me in loving and serving Christ. It can be my family and Christ. 5. Even in a Christian household the call to obey Christ must take precedence. The fact that Spurgeon used the opportunity conferred by the annual Christmas holiday to preach the gospel of the Incarnation in no way diluted his Protestantism, anymore than the usage of pagan names for our days of the week (Monday, Tuesday etc.,), and months of the year (January etc.,. ), makes today's Christians into pagans. The old "chestnut" is resurrected every year about ChristMASS, as if every person even using the term is about to become a Papist! Some folks love to quote Spurgeon very selectively in relation to ChristMAS, rightly pointing out,of course,that he fully rejected Romanism, but conveniently ignoring his embracing of "the good accidentally conferred by the season"(CHS quote). Such people usually do not have the courage to label him a "compromiser", yet do not hesitate to condemn gospel preachers who organise their worship services in December in the same way as CHS did each year. It is patent nonsense to tar faithful gospel preachers with the same brush as the worshippers of the "pancake god", simply because they use the ChristMAS season to proclaim the truth about the Incarnation. Are these annual hobby-horse riders the only faithful custodians of the Faith? I think not. Perhaps soon they will show a similar zeal to take Janus (pagan goddess)out of January! In this regard I also found the articles by another sermonaudio preacher, Bob Vincent of Grace Presbyterian Church of Alexandria, Louisiana to be of interest. See "A Short History of Our Experiments With Christmas" which he signs, "a recovering neurotic" and "John Calvin's Christmas Observance." I went to my second meeting of the Uniting Church and Home Network in Richmond last Thursday. Eric Wallace recommended the recent teaching by Gregg Harris at Piper's Bethlehem BC 2007 Men's Retreat that can be found online here. I'm working my way through them now. I just finished reading Alister McGrath's J. I. Packer: A Biography (Baker, 1997). McGrath goes into great detail about the various intrigues regarding Packer's academic appointments (reminding me of one wag's comment that when it comes to academic politics never do the passions run so high when the stakes are so low), his influence as an evangelical within Anglicanism, his break with "The Doctor" (Martin Lloyd-Jones) over separation, controversy over his signing of "Evangelicals and Catholics Together," etc. On the other hand, he says almost nothing about Packer's personal life or family. There is some mention of his marriage to Kit but there are exactly two sentences about Packer's children: "The Packers subsequently adopted three children: Ruth, Naomi, and Martin" (p. 69) and "His children's education could be arranged" (p. 234; in reference to his move to Vancouver). Can you know the man without knowing his family? Ed Setzer had this picture posted on his blog. 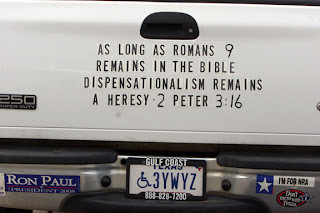 It was on a truck parked in the Ridgecrest lot during the "Building Bridges" Calvinism Conference. We see a lot of bumper stickers in C-ville, but I don't think I've ever run across this one. The greatest need of Christian children is to see their parents walking with Christ. The greatest need of a congregation is to see its pastor living in true piety. And the greatest need of the church today is a holy walk before the Lord. We might add that the greatest need of the world is a holy church that holds forward a sinless Christ who died for sinners once for all on the cross. Let us examine ourselves (2 Corinthians 13:5). Parents, are we living godly lives without hypocrisy before our children? Those in spiritual leadership in the church, are we seeking true piety? Every member of the body, are we walking in holiness, living for the Lord in a way that is separate and distinct?